One of the interesting things I saw at VRLA is the RigRover, a remote controlled stabilized dolly designed for 360 cameras. 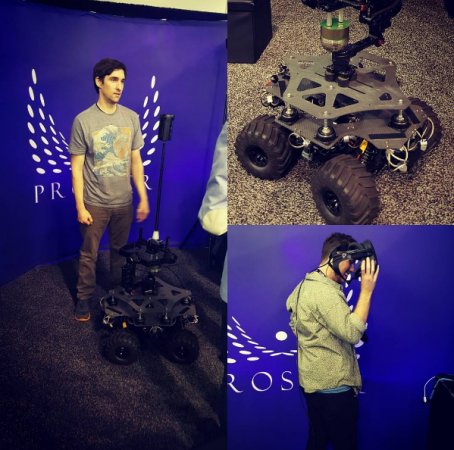 ProsperVR’s RigRover is a stabilized, remote controlled dolly designed for 360 cameras. The chassis has a suspension system to smoothen bumps. In addition, it has a gimbal to keep the camera level and oriented in the same direction. The RigRover’s gimbal is modular and can be used to mount a 360 camera on a drone. Unlike other similar motorized gimbals on the market, the RigRover is very maneuverable and can turn in a very tight circle. It has a relatively small profile compared to other motorized dollies for 360 cameras (see the sample 360 video below). The RigRover is available for rent for $750 per day during the introductory period. It’s available from RigRover.com.